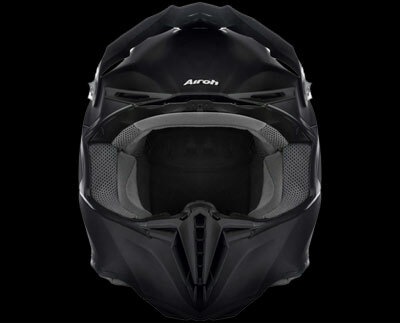 The Airoh Twist is a competitively priced motocross helmet and one of the lightest in its price category. It offers a perfect combination of price, quality, comfort and safety. This off-road helmet is specially made for the use with motocross and enduro, but can also be used on the road. 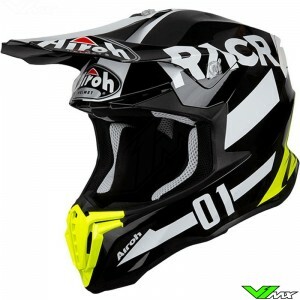 The Airoh Twist is a motocross helmet packed with good features that help dirtbike and enduro riders. The most important characteristics are explained below. The ventilation system of the Airoh Twist is simple but very effective. There are 2 large inlet holes under the peak. Air is pushed through by the air pressure at the front of the helmet. In the helmet, air is distributed over the head of the rider. The back is also equipped with two ventilation holes, these are the outlet of hot and humid air. Due to the vacuum that arises behind the helmet, air is sucked out of the rear ventilation holes. The chin guards has 3 channels through which the air flows. Airflow is then distributed over the riders face for a pleasant cooling effect and supply of fresh air. A fine sponge material is placed inside the chin guard. This helps to filter dust so that you get cleaner air to your lungs. The inner lining is made of open structure material, for maximum comfort and great breathability. The cheek pads and central lining can be disassembled and washed for better hygiene. The shell of the Airoh Twist helmet is made from a special thermoplastic material that is very resistant to impacts. By performing FEM simulations, the helmets are optimized for maximum strength and protection. Experts at Airoh have paid a lot of attention into minimizing parts, in order to keep the weight low. Because of the innovative construction the Twist only weighs 1180 grams (+/- 50 grams). This is very low compared to motocross helmets from the same price category. At Airoh, safety is the most important starting point. This model also meets and exceeds the highest safety requirements and has a large degree of impact protection. Another important part is a good retention system. The Airoh Twist is equipped with a double-d retention system for a reliable fit to the head. The big advantage of this type of closure is the ease of applying the right tension, so you know for sure that the helmet is attached properly and can’t come loose. The Airoh Twist can be recognized by the modern look and sporty appearance. This affordable motocross helmet has a large eye-port, which has two advantages. Frist, the helmet will be compatible with almost all modern motocross goggles. Secondly, your view is not obstructed, so that you can see everything that happens in front of you. 6 sizes are available ranging from XS to XXL. There are two shell size to provide a good fit for all riders. The Twist has an adjustable peak, which can help you by blocking sand and stones for unobstructed visibility. In addition, it also helps to see better by blocking direct sunlight. 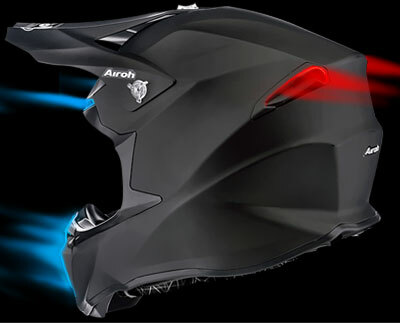 Another reason why the Airoh motocross helmets are so popular are the beautiful graphic designs. The Twist is available in more than 10 designs and color combinations, so you always can find something that fits with the rest of your motocross gear. Airoh is a sponsor of 9-time motocross world champion Antonio Cairoli. Together they brought new designs to market every year with the iconic Cairoli color, fluo yellow. 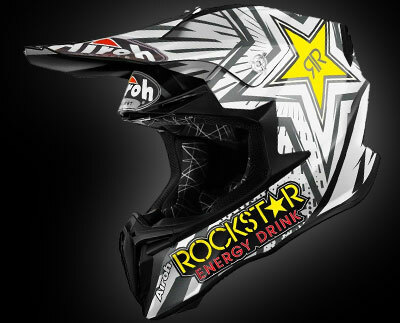 In addition, Airoh is one of the few brands to release a Rockstar motocross helmet. Keep an eye out on this page and the V1mx social media pages to keep up to date with the latest versions. Determining the required size is simple, using a measuring tape and the size chart below. Use a soft measuring tape and then measure the largest diameter around your head. Start about 2cm above your eyebrows. Keep the tape measure above your ears around the back of your head at the biggest point. V1mx has a size chart available for all gear, which allows you to easily find out which size you need. Does the motocross not fit as expected? We have a 30-day policy for returning or exchanging items for another size. Do you want to order a new motocross helmet, but do you have a question about it? Do not hesitate and contact V1mx, we are happy to help you. Because of our large range there is always a product that meets your requirements.